To say that Aleister Turtley is slow is to misunderstand the workings of his mind; it is merely that he likes to take his time, to consider, to analyze, to scrutinize, to sunbathe, and to prepare exquisite meals of shrimp and vegetables. So while his spells may at times take him years to complete, that does not mean he is incapable of performing magick of the highest order. Neither, in fact, is he incapable of acting quickly if provoked, as an unfortunate princeling once discovered after mocking the mystical symbols on Turtley’s shell, much to the loss of his fingers. 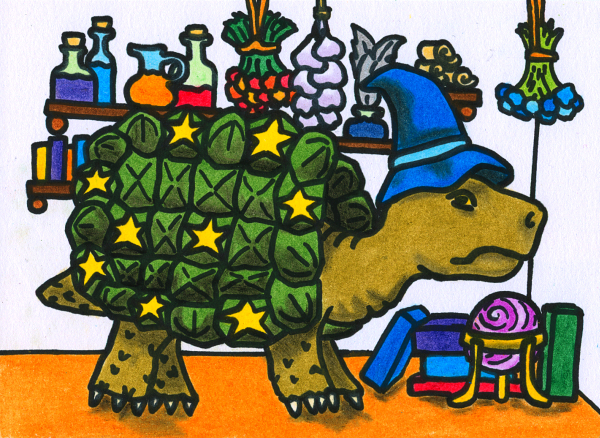 Born in Warwickshire, Turtley spent his youth travelling to places of mystical power, especially seeking out those that are less rainy than his home country. He stayed in Egypt for several decades, napping on the Nile and occasionally turning annoying crocodiles into euglenids. Later he travelled around India and Tarphet, where ancient spirits dictated to him recipes long-forgotten; after that he worked as a sorcerer-cook in a small town in the valley of Ooth-Nargai, cooking shrimp caught in the Cerenerian Sea, and later yet he researched the secret powers of vegetables in Toldees, Mondath and Arizim. Only few have reached the level of mastery evident in Aleister Turtley’s cooking. His skills at applying the art and craft of magick to the preparation of dishes is such that at one time, he became a high-ranking member of the Hermeneutic Order of the Golden Prawn. That was a long time ago, however, and he has since rejected that organization as serving the interests of Urizen. With the passage of the millennia, Turtley has become increasingly slow and thoughtful. He has repudiated many of the excesses of his youth, though few are old enough to remember what those were, and dedicated himself to being a kinder, more perceptive chelonian. His friendship with the magician/inventor known as Old Man Bill, as well as his correspondence with the philosopher-turtle Zathras (published by Oneiropolis University Press as From Exoskeletons to Inner Peace: The Turtley-Zathras Letters), have done much to shape his worldview. He still believes that food is one of the greatest pleasures in life, however, and endeavours to make each meal an occasion for joy, even if it takes a while to prepare. Food is also the central tenet of his slowly-forming political beliefs: namely the right of each being not only to basic sustenance, but also to the delight that a more luxurious meal can offer. The picture used in the Compendium depicts him in his room at the House at Desert Bridge, where he spent a few years experimenting with the higher properties of garlic. This entry in the Oneiropolis Compendium was made possible by the mysterious entity known as rzuf.